Perhaps you remember the long list of amazing paper tutorials Jeffery Rudell wrote for CraftStylish.com a few years ago. I featured him here on All Things Paper when this blog was practically brand new, and believe it or not, his name still shows up as a top search term. Yes, Jeff's work is truly that memorable due to his gift of combining impressive, yet doable projects with a talent for storytelling. You may have already seen the announcement on Craftzine recently, but I'd be remiss if I didn't mention that Jeff has a newly released book. 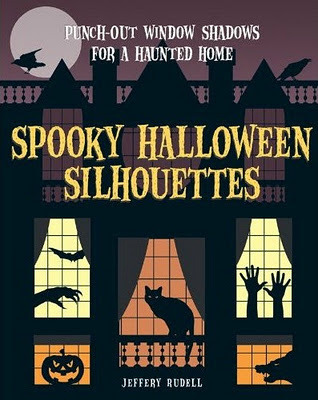 Out just in time for Halloween decorating, it's called Spooky Halloween Silhouettes: Punch-Out Window Shadows for a Haunted Home. 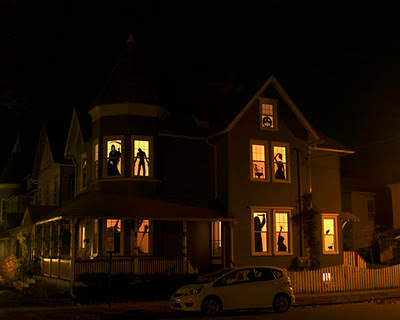 The 28 designs look to be a simple and effective way to ready your house for any tricksters who come a-treating. The impetus for the book was this Victorian home that Jeff decorated for a client by creating huge silhouettes for every window and door. Doesn't it look eerie-fantastic?! 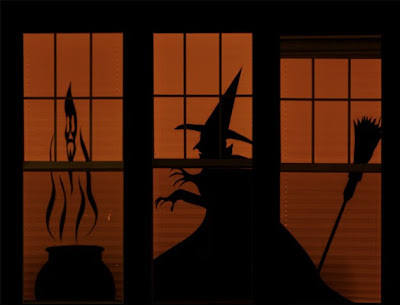 Be sure to check out the new tutorial Jeff wrote for Craftzine that features three creepy silhouettes to get you started. He also gives instructions for enlarging the images to full window size. Have you seen the lovely little video titled Whale Fall that's been flying around the internet the past few days? It uses paper cuttings and puppetry to demonstrate the decomposition of a whale carcass after it sinks to the bottom of the sea. Sounds pretty awful, but it isn't... in part due to the wondrous music by Rachel's that accompanies the rustic artwork. The Paper Mojo Giveaway for two pounds of decorative papers from around the world ends at midnight tonight. Winners will be notified and their names will be posted tomorrow morning. Good luck! That house must have been something to see! Amazing. The whale fall video ,so beautiful Ann. I LOVE these Halloween silos! They are perfect for my spooky house. I also loved the Whale Fall video. The cut paper art is lovely, and the soundtrack is elegant. And then there's this simplistic way of telling the complicated story of what happens to a dead whale. Overall, it's moving. Nothing on the whale...just a blank place where the video should show??? Sorry I missed it. The silhouettes are wonderful!!! a beautiful I love it!